> software authors / vendors may request 'whitelist' and users may report as 'false positive'. Users may Exclude software known safe by user & trusted by user. Or maybe the ones that did not detect anything may not have a similar detection tech to try to detect zero day infections. No one wants to have false positive detections, but it is better than just allowing a real infection to get into your computer by being too conservative. As bjm_ notes, you can report the false positive detection to help Norton better deal with that specific software. Ok ... as I may understand there's one only real solution ... ask the authors to request a "whitelist" ... as some may update their softwares very regularly ( new working way of many editors nowadays ). You'll surely understand the user will do it twice or three times and afterwards .... will loose patience. Now we know what to do: .....make pressure to the editors to ask a whitelist at Norton .... what will their answer be: ... change your security system ! Stupid world we're living in now ! Bye and maybe for good.... I'm hesitating between deleting Norton from my PC at the end of subscription or right now ! and sure I will not be the only one..
Or you can report the false positive. See this thread where bjm_ helped a user by submitting a file and got a quick reply that the file would no longer be detected. Already done and .... no change !!!!!!!!!!!!!!!!!!!!!!!!!!!!!!!!!! How many time do we have to do that ? 100 times ??? as I'm surely not the only one to have done this submission. There's something wrong somewhere or everywhere: we live in a world of communication ... but it seems that's no longer the case inside the offices or societies now ! NB: I always keep my important mails saved ! NB2: deleted as the message at the end of the message doesn't allow me to communicate it. There must be something in the code that triggers the Norton detection. Some behavior that resembles something that malware might do. Unless the developer gets the product whitelisted, each time a new version is sent out, it will have a new hash and will appear as a different product to the Norton Scans. If it exhibits the behavior of a possibly malicious program, it is going to get flagged. Sorry if we are not giving you the answer you are looking for. What you describe is exactly the way polymorphic malware is able to avoid standard signature-based detection. It is not unusual these days to have malware which morphs with each new installation, so that every infected system has a unique variant of the threat. Far from being "stupid," the capability to prevent these types of mutating threats from successfully installing on machine after machine is essential for any antivirus program..
although what you said is true, you have to admit getting 5 "trojan8" viruses in the space of half an hour isn't ok, and is extremely annoying, especially if its a trusted and proven safe file. Norton (windows 10 22.9.1.12) just removed my VPN!! Has to be a false positive! becouse i am the one they cal if they have pc problems . This has happened to me for over a year now. I trusted Norton, so I believed the findings and moved on with my work. I work in music and video and use many, many plug-ins. I store many of them on extra internal HDs and thumb drives. I keep the plug-in programs with their setup.exe files as back ups, ready to install in case of problems. 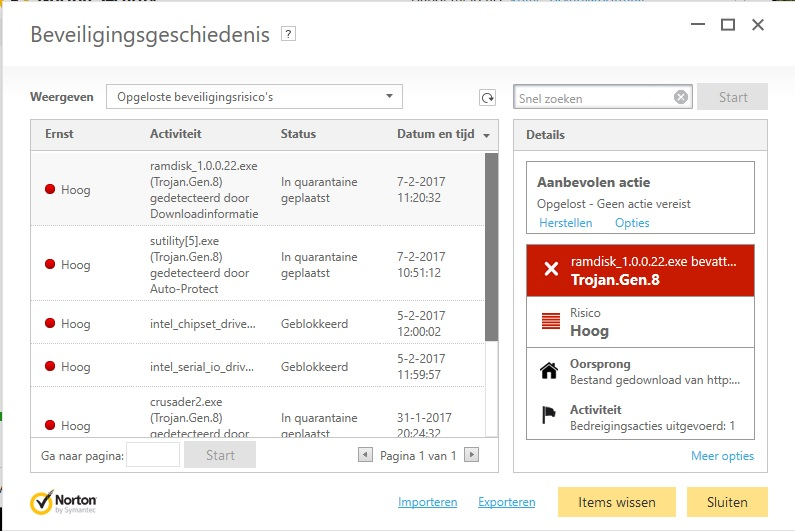 Now I find Norton has been removing the setup.exe files as Trojen's, then when I go to restore them, it puts them in the wrong place...like my Documents start up folder. Sometimes there is no path for restoration. It just states that it was removed, but I can't restore it. These plug ins are very expensive $$$. My only option is to shut down Norton. I am beyond angry with Norton. Can you put these important plug-ins into a folder and put this folder into put them in a place where they should not be scanned. Please be sure they are all are clean. Please put the files here. Will doing this help any?